Stoughton Town Hall is located at 10 Pearl Street, Stoughton, MA 02072; phone: 781-341-1300. 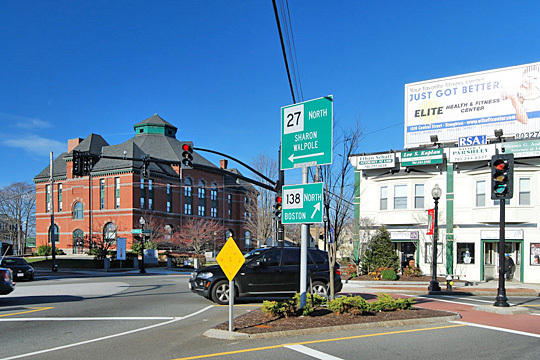 Photo: Stoughton Town Center, photograph by Marc N. Belanger, en.wikipedia.org, accessed February, 2011. First settled about 1713, Stoughton was incorporated in 1743. It was named for William Stoughton, Lieutenant-Governor of Massachusetts (1694-1791), whose father, Colonel Israel Stoughton, commander of the Colonial forces during the Pequot War of 1636, was large landholder in Dorchester, of which Stoughton was originally a part. During the American Revolution, Stoughton was the supply center for Colonial forces in the area, though there was little industrial development before 1800. By 1830, shoe manufacturing had begun; but the Civil War, depriving the town of its large Southern markets, threatened the prosperity of the factories for a time.